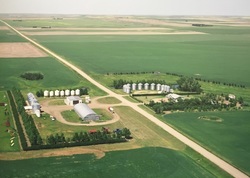 We are a West Central Saskatchewan grain farm producing a variety of cereals, oil seeds and pulse crops. We believe success in agriculture grows from a strong agronomic plan, organized and effective management, efficient and precise field operations and a focused commitment to marketing. The First generation of the Lloyd family farm started with John Lloyd Sr. who immigrated to Canada in 1926. He came from a very small poor farm in Wales, leaving behind a family of four brothers and two sisters. Seeking opportunity in Western Canada led him eventually to the D’Arcy area. Working odd jobs and finally renting some land south of D’Arcy, where he met a local gal named Marjorie Cook. They were married in 1938. They had two children, a son Mervin (second generation) in 1939 and daughter Mary in 1942. It was around this time (approx. 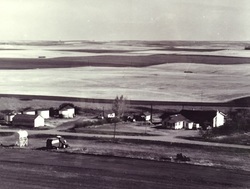 1943) that a local homesteader, Willard Booth, decided to retire giving John Lloyd the opportunity to purchase three quarter sections of land on what is still the present day farm site, seven miles south of D’Arcy. Several years later John would add one more quarter to the farm bringing the farm size to 640 acres at the time of his retirement. John was a very patient, mechanical innovator. It was said he could make anything work. 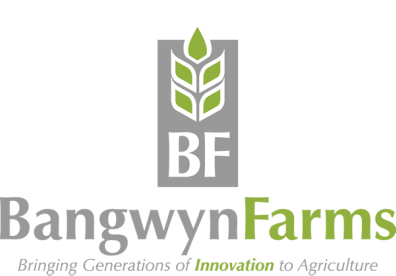 His determination, strong work ethic and perseverance gave the Lloyd family a solid foot hold in Western Canadian agriculture. 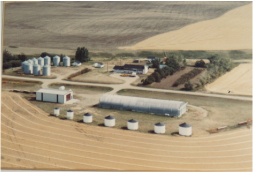 Over the years they expanded the farm, including building a new home in 1975, along with many other improvements, such as bins, a large quonset , and a heated work shop. Mervin was innovative like his father. Crop diversification was a key factor in his farming success. He was on the leading edge of several crop introductions to Western Canada. Mervin was mechanically gifted and was the inventor of several agricultural machines and ended up holding several patents in North America. Also an astute businessman, Mervin incorporated the farm in 1981. Mervin and his son John began farming together in the late 1980’s. By this time Mervin had grown the land base from four quarters to eighteen quarters. John took on a more permanent role after meeting and marrying Tana Hornung in 1993. John and Tana moved to the farm and Mervin to Fiske in 1995. John and Tana have three children, Kali, Alex and Thomas, and continue to enjoy raising their family on the farm. John has brought a greater level of organization and efficiency to the farming operation. Since taking over, John has continued the gradual growth of the farm. 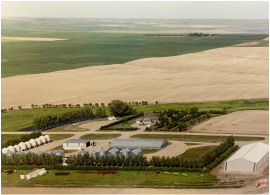 Having several employees, and a ten thousand acre land base the farm continues to evolve.